U.S. Trade Representative Robert Lighthizer listens at left as Vice President Mike Pence speaks May 15, 2017, during Lighthizer's swearing-in ceremony in Washington, D.C. On Monday, the Trump administration released its objectives for NAFTA renegotiation. McALLEN — Two Texas lawmakers are seeking more information from the Trump administration regarding NAFTA renegotiations. Texas Republican Sen. John Cornyn and Laredo Democratic Rep. Henry Cuellar wrote a request to President Donald Trump’s trade representative Thursday seeking a meeting with all members of Congress representing districts along the U.S.-Mexico border regarding the upcoming talks. 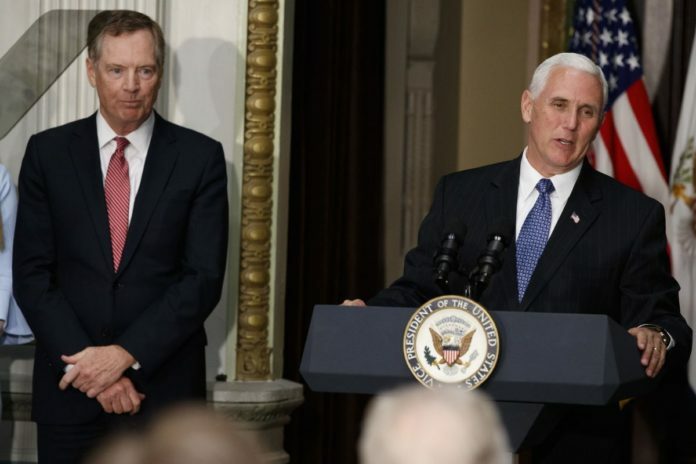 U.S. Trade Representative Robert Lighthizer sent a notification to Congress on May 18, which triggered a 90-day period before the United States, Mexico and Canada can sit down for renegotiation talks. Lighthizer met with the House Ways and Means Committee, which is the committee on the House side that NAFTA falls under. Lighthizer said Trump wants to expand free trade. The conversation did not escalate, but certain members criticized Lighthizer. Massachusetts Democratic Rep. Richard Neal, the committee’s ranking member, broached on “a lack of clarity, consistency and constitution.” New Jersey Democrat Bill Pascrell chimed in as well.